The story starts last year, when our Cub Scout Pack's old wooden track was showing severe signs of old age. Inherited from a forgotten past, no one in the current pack even knows when it was built. It has been repaired again and again, with duct tape, glue, new paint, old paint, replaced brass joins, etc. keeping it going year after year. When one of the 4 tracks became unusable last year (cars on the track were jumping off the lane, into other cars, damaging both), it was determined that a new track was needed. 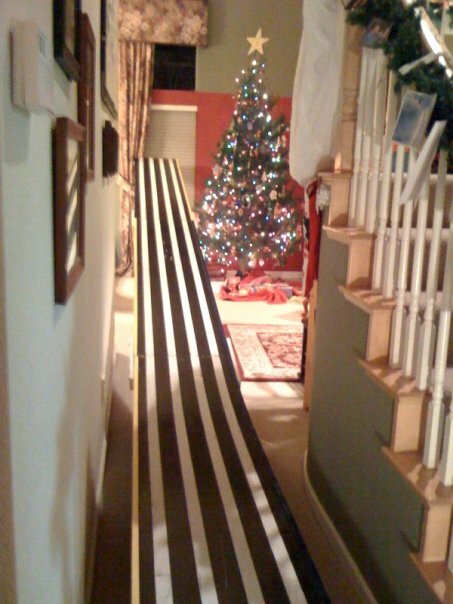 All fundraising was dedicated to the purchase of a new fold-away aluminum track, which would no longer require anyone in the pack to dedicate their garage to storing the old behemoth. DH and I saw an opportunity. Enquiries were made as to the ultimate disposition of the old wooden track. The response was shrugs. No one else was interested in its fate, and most just saw it as a problem of disposal to be solved later. DH's father was a carpenter, so he has a natural affinity for anything wood. Our boys have a natural affinity for anything ramp-like for racing cars of all kinds. We had already planned to sell all the Thomas the Train materials on Craigs List. We made an offer to the Pack for the proceeds (sell lots of little tracks for one big track). An agreement was reached. A surprise was planned. In the meantime, Barley had decided he did not want to participate in the Derby this year. Since he has also made assertions (which have so far been ignored) about wanting to quit scouting, this was likely the last Derby for him. Teddy is crossing over to Boy Scouts, so this is his last year too. DH was very disappointed, but I reassured him...wait until they see the track IN the house. Barley will come around. DH and I had been up until 2:00am putting the track together. We made no pretensions about anyone but us bringing it in. We heard the boys whispering disbelief to each other outside our door, and got out of bed to enjoy their incredulous reactions. The track is about 35 feet long, and 5.5 feet high on one end. As you can see from the photo, it took up our entire "hallway", blocking access to the kitchen and the stairway. You had to walk under or over it to get through the day. It was another 40 minutes at least before the toys from Santa got any attention at all. The boys discovered that not only do pinewood derby cars roll well on the track, but so do hot wheels. A new purpose for the diecast cars was discovered, augmenting the "crashers" game they've played with their cars for years. Barley did indeed make a full turnaround in attitude. He was now fully committed to making a new car for the derby, and willingly participated in a greater percentage of the overall work effort. Some things are truly priceless. 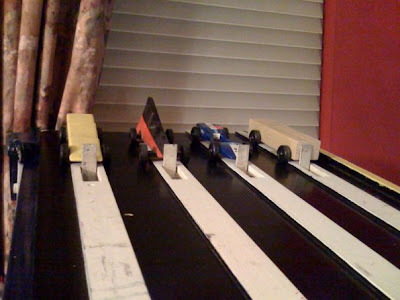 Read Pinewood Derby Part 2 of 2 here. So very awesome!!! I wish we would've had that in our house! Score A+ for the parents! - Muskeg Harpy's mawwwwwwwwwwm. Very cool! I remember my pine derbies and Soap Box derbies fondly. Dad and Pop helped me...well did most of the work....but I helped...I think. My Dad (the woodworker!) helped me quite a bit with my own cars, too. In fact, the red and black "wedge" in the last picture above was our 2nd car--the scribbles on the bottom indicate it's from 1975! Still makes it down the track, just takes it a bit longer these days. Hm, there's a metaphor in there somewhere! Anyway, I'm really proud of the work the boys put into their cars this year...which I imagine we'll hear about in Part II!